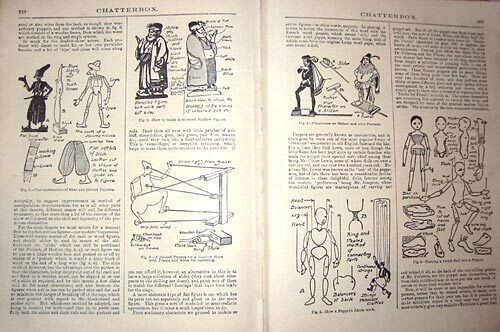 The series of illustrated articles by H W Whanslaw, in the 1923 ‘Chatterbox Annual’, were re-published in 1924 as a book under the title ‘Everybody’s Theatre’. The interest created by this book, resulted in the formation of ‘The British Model Theatre Guild’ in 1925 and in turn, to a partnership between Harry Whanslaw and Waldo Lanchester. Lanchester and Whanslaw’s pioneering experiments and successes with their London Marionette Theatre (founded 1927) formed the basis for a series of further finely illustrated books by H W Whanslaw and it was the renewed enthusiasm generated by these highly practical and informative “how to do it” puppet books that forged the future course of puppetry in the UK. Puppets were formally embraced by the British Model Theatre Guild in 1932, when the organisation was re-named "The British Puppet & Model Theatre Guild." The above books and the many others written and illustrated by H W Whanslaw continue to inspire new generations of puppeteers even to the present day. David Currell acknowledges their importance and influence in his 2004 book "Making & Manipulating Marionettes."